*Designed for courses relating to children with hearing impairments generally titled Pediatric Audiology or Hearing Disorders in Children. 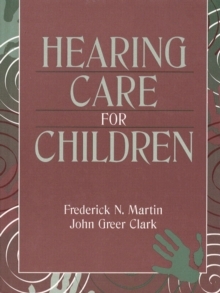 *Modern approach to pediatric audiology written by some of the leading authorities in diagnostics and rehabilitation for children with hearing impairments. *It is well-written, flows smoothly from chapter to chapter, and includes state-of-the-art approaches that are clearly outlined for the novice and yet interesting and helpful to the practicing clinician.